Personalized Lip Balm Tin Custom Printed in Bulk or Blank. Promotional, Inexpensive. Budget Prices in the USA and Canada. Wholesale advertising Lip Balm Tins with optional direct imprint. Lowest cost in North America. We also supply blank (not customized) Lip Balm Tins: see Price List below. Free Artwork Design. American Clients pay no taxes. The unit prices below include your full color custom imprint on a decal, or they are for blank items. Add $0.25 per lip balm tin for full-color direct imprint on the tin. Full Color Direct Imprint on the tin: : add $0.25 per unit. PRODUCTION TIME: 3 working days after art approval; Blank (not personalized) Lip Balm Tins ship next day. 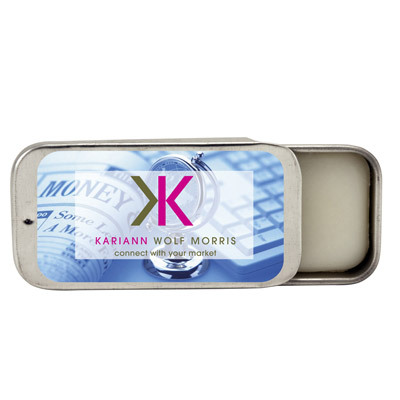 Slide out of dry promotions with this lip balm tin slider. Made with Vitamin E and Aloe Vera, this lip balm is made in America, FDA approved and PABA free! Refresh your lips and branding to the public with this moisturizing slider. Lip balm is printed with the option of one color Direct print or Full Color Process Decal. Our chap balm is an excellent give away for tradeshows, hotels, spas, salons and any outdoor event.